Follow these fun and easy steps and let me tell you how to make a patchwork boro bag, lay some pieces of fabric together and a few quilting stitches here and there, and your new bag will be ready in no time! If you love to try new techniques you will love to try to make this Boro bag, today I share a full tutorial and a video so it will be easy for you to follow the steps I did to make this patchwork boro bag. This bag size might look small but it’s perfect to carry with you a few things, I’m sure you’ll love to make it and you might make more than one as they are perfect to give them as a present on a birthday or on a special day to your mom, daughter, or to your best friend! 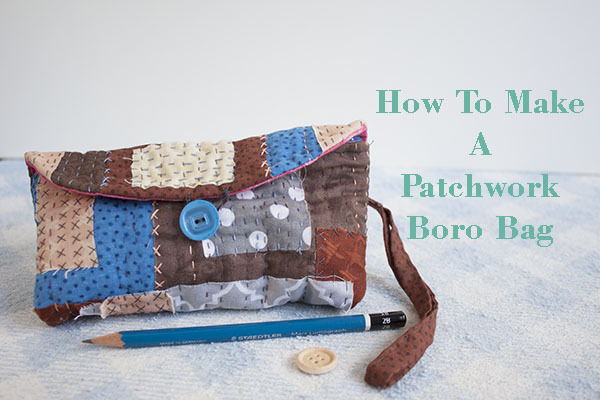 How To Make A Patchwork Boro Bag. You will need to make this bag. A few pieces of cotton 100 % fabric in different color and prints. I share some affiliate links on this post, by doing this if you buy something on Amazon, I’ll get a small % of your purchase, this way you help me to keep working on my patchwork and quilting projects to share them here on my blog. This time, you don’t need a template to cut out all the pieces of fabric, you can cut the pieces of fabric to make your own patchwork boro bag on your own design, you can follow the design I did, but the pieces of fabric don’t need to be the same size as mine. Lay the pieces of fabric on the batting fabric. Place a few pins on the pieces of fabric to hold the pieces on their place while you do the first stitches of quilting, as you keep quilting, you can remove the pins from your work. 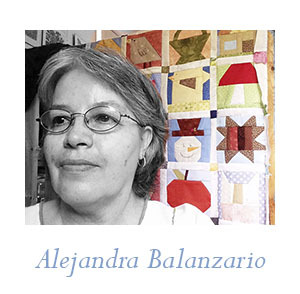 The boro quilting does not need to follow a pattern or a template, you can cut the pieces of fabric and place them one over the others to find the design you like the most. Whenever you’re happy with the display of your fabric pieces, you can start making the hand quilting, as little or as much as you decide to, there’s no rule here either. I think what I liked more of this boro technique is you can work on it the way you love it. Stop to do the quilting when you’re happy with the quilting. You can download the bag template and print it, then cut it out and you will need to mark it on the fabric for the inside of the bag on the back side of the fabric, you can use a soft pencil or a pencil for fabrics to work on it. Place this fabric on the boro quilt, front side facing front side, and sew on the line with your sewing machine, don’t forget to leave about 2 inches open to turn it out. Trim with your scissor all around. Make some little cuts on the curved area of the bag, cut diagonally all the corners, and do little cuts on the inside angles. Turn it out and with the help of your scissors push out the corners. Once your boro bag is turned out, it should look like this. Do a few quilting on it to quilt the inside fabric a little. On this photo below, you can see the quilting I did to quilt a little the fabric for the inside. It’s time to sew the zipper on the bag, place it on this side of the bag, and sew it by hand, this time I’m following the Japanese technique to make a quilted bag, they do it mostly by hand all the work. The next step is to sew to close both sides of the bag, also by hand. On the video you can look how I did it, I did the video in Spanish but I think it will give you a good idea on how I sew to close the bag. After both sides of the bag are closed, place the other side of the zipper on its place, hold it on its place with the help of a couple of pins and sew it by hand. To have good finishing on your boro bag, place the end of the zipper like this photo below and sew it to the bag with little stitches, this way it will remain on its place. Do the same with the other end of the zipper. Well, your boro bag is almost finished and it looks nice by now! You need to sew a button on the front, and make a button hole with thread, make a few layers of thread at the edge and finish it with button hole stitches. To carry this boro bag, I added to it a handle, you can make it also for your boro bag. Fold it like a bias, and sew it by hand, fold it on the middle and sew it on a ring, do the same with a 2.5 x 3″ and fold it on the middle with the ring inside and sew this little strip to the boro bag on its back part. Congratulations your Patchwork boro bag is finished and ready to use or to give it as a present! It didn’t take long to finish it and it looks very nice!! Don’t forget if you make it, I would love to see it, you can always share a photo of it on my Facebook Page Alejandra’s Quilt Studio on a comment. I will love to give you a LIKE on it!! Don’t forget you can also follow me now on my YouTube channel and be the first one to watch my new videos, I will love is you give me a like, a comment and share my videos! If you have any question about how to make a patchwork boro bag, leave a comment here and I’ll reply to you shortly.